There are a series of objections to the proposed sale by the Borough of Northampton of the ancient statue of Sekhemka from the town's museum. The statue was donated 'in perpetuity' to the Northampton Museum over 100 years ago by Lord Northampton’s family. The museum's governing body however seems determined to betray the trust placed in it and want to sell the statue. It is reported that a deal has been reached whereby the present Lord Northampton will receive 45% of the proceeds of the sale, with Northampton Borough Council receiving 55% . Sniping xenophobe collectors and their lobbyists object to Egypt's new Minister of Antiquities Mamdouh El-Damati expressing disapproval of the sale They miss the point entirely. The Minister's statement indicates an extreme shift of policy. El-Damati has denounced the decision made by Northampton Museum, claiming that it is against the values of museums world wide as they should act as vessels to spread culture, rather than businesses searching for a profit. This is totally at odds with the policies publicly expressed by previous Ministers which demanded iconic objects and others be returned to Egypt. Collectors claim that antiquity collecting is all about spreading culture, but their notion of that is through private possession of trophy objects like this one, which is why on their websites and forums they simply ignore this important shift. I doubt it was "given" by an Ottoman sultan - no documentation of such a gift has ever been produced. The spokeswoman is simply wrong. There is nothing exclusive about the 1970 UNESCO Convention. Of course Egypt has a right to ask for the return of something taken out of Egypt in the past which is no longer wanted by those who hold it in trust. What she means is there is nothing in the Convention (or international or local law) which would oblige Northampton to comply. That is a totally different matter. If Northampton do not want to continue to look after this statue, and no other public collection in the UK will take on this role, then it should be offered back to Egypt. Sources: 'Egyptian government launches last-minute legal bid to stop sale of Sekhemka by Northampton Borough Council', Northampton Chronicle and Echo 7th July 2014. 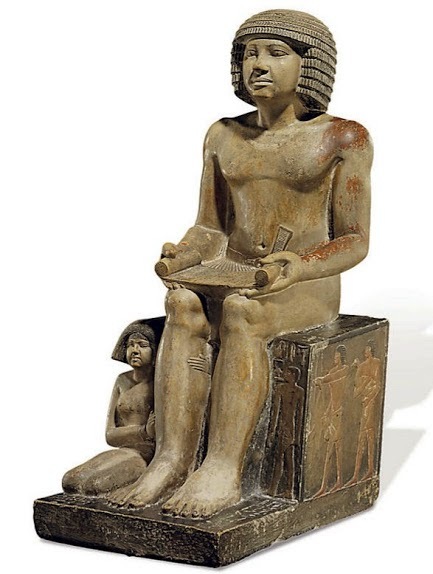 'Egypt threatens legal action to stop UK museum selling ancient statue', Al Arabiya News Tuesday, 8 July 2014. Northampton residents have formed a Save Sekhemka Action Group. Sign the petition now, just two days left to convince the Borough's footwear philistines they are doing wrong. To Councillor David Mackintosh, Leader of Northampton Borough Council STOP the Sale of Sekhemka by Northampton Council.